Mandarin Oriental, Sanya is the official partner of Hainan Rendez-Vous, China’s premier luxury lifestyle show being held from 1 – 4 April 2011. Hainan Rendez-Vous combines private jets, yachts and mega yachts, luxury real estate and lifestyle products, showcasing the finest brands the world has to offer. Guests staying at Mandarin Oriental, Sanya over this period can enjoy exclusive, complimentary access to the event. Synonymous with high end luxury, Mandarin Oriental, Sanya is an obvious partner for the glamorous event, elegantly mirroring the high-end products being showcased, and providing the epitome of spacious accommodation and refined sophistication. Spread out over 12 hectares, the hideaway retreat is situated on an unspoiled nationally protected coral beach and nestled amongst lush tropical blooms providing peace and tranquility. Visitors to the resort can enjoy beautifully designed, oversized guest rooms with panoramic views over the azure South China Sea. The resort’s award-winning spa is where guests will be utterly pampered in idyllic and serene surroundings. The exclusive weekend event is being brought to China’s southernmost tropical island by luxury marketing company China Rendez-Vous and Visun International Yacht Club, Hainan’s first international world class marina. 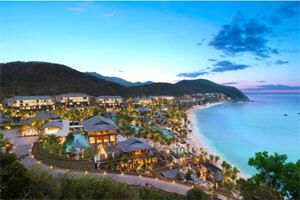 Sanya will be witness to unprecedented luxury, and a guest list that reads like a who’s who of the luxury industry. The province has been enjoying rapid development since it gained Special Economic Zone (SEZ) status just over 20 years ago, and the premier tourist city of Sanya is now being billed as the ‘Chinese Riviera’. The alluring display of high end luxury products is designed to mark the spectacular inauguration of Sanya as a cruising centre for the South China Sea.